Notes: 1. 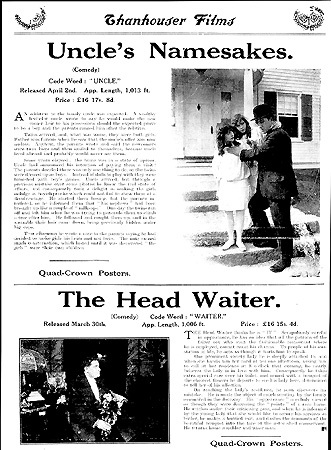 The title appeared as Uncle's Namesake in schedules published in The Moving Picture World in December 1913. 2. A cast listing in The Photoplay Magazine, February 1914, erroneously listed "Mr. Brady" in the role of Uncle John Henry. 3. A print preserved by The National Film Archive (London) reveals that the character identified above (as taken from trade notices) as Jack, a needy young husband, was named Will Carson in the film, as per his signature on a letter ssent to his uncle, John Henry Carson. Although the synopsis from Reel Life and a review from The Morning Telegraph, reprinted below, indicate that Jack was "just managing to grub along" and was a "poor young suburbanite," the film itself shows Jack (or Will Carson) living in a large, beautifully furnished mansion, with elegantly landscaped lawns and shrubbery, and with a maid to help with chores. The inconsistency of having "poor" people live in very comfortable circumstances has been observed in certain other Thanhouser films as well. "The story comes out better than a good many crusty uncles and millionaire relatives would like to see it come out - but it is not improbable, at that. The young suburbanite is just managing to grub along, but he has expectations from a wealthy elder brother in England - who says that if the American's first child is a boy, he will send $5,000.00 and make the child his heir. The first child happens to be twin girls - but that doesn't bother the resourceful father, who cables that he has named one boy John and the other Henry, after the rich brother. In time, of course, the Englishman hears of the fraud - comes to America - finds the girls dressed as boys, as he had expected - and teaches them all sorts of boyish games and pranks - baseball, boxing, rough-house, etc. But he is so won over by their personal charm that he forgives the deception and is glad they were girls after all. The play is thoroughly human all through." "Besides Lila Chester and Messrs. Thompson and Bracy, the Thanhouser Twins contribute to the good acting in this film. The story is one that is hardly plausible, but is nevertheless interesting. A poor young suburbanite receives word from an elder brother in England that if his first child is a boy he will send $5,000 and make him his heir. The first is, or are, unfortunately, twin girls. The father writes that he has named them John and Henry, but the Englishman ultimately learns of the fraud. He comes to America on a visit a few years later and finds the girls dressed as boys. He teaches them all sorts of boys' games and sports, but in the course of his instruction he finds them such charming little persons that he forgives the deception which the parents have practiced." "A clever story written about the Thanhouser Twins. Uncle John thinks they are boys, but later learns that a deception was practiced upon him. The scenes are lightly amusing and the picture will be well received." "This is an excellent little comedy subject well put on. The comedy of the picture is spontaneous and refined, and the players natural and individualized in type. As the story runs, the rich uncle, with ungrounded anticipations, sets aside $1,000 [sic; inconsistent with the $5,000 mentioned above] for the expected son and heir of his brother, who is to be named for him. The son and heir turns out to be twin girls, who, on the event of their uncle's visit are dressed as boys to deceive him. The shrewd old man has his own fun out of the incident, and, in spite of the discomfiture of the father and mother, all turns out well."